Tradewinds Cafe and Catering Co. Image via Facebook. When challenges blew their way, this restaurant’s business plan kept them on course. We wanted to know: What growing pains do business owners face once they have opened their doors? What are their struggles and successes? Check back in next week—we’ll be telling the unique story of another small business. Mark Head and Abbie Shadrick’s business plan came to life in January 2015 with the opening of Tradewinds Café & Catering Co. Built with a “Mediterranean backbone,” Tradewinds gave Head a chance to experiment with a diverse geography of cuisine while giving customers a fulfilling experience. Tradewinds was the first restaurant to startup through the Sprout! business incubator program in Springfield, Oregon. Through the Sprout! program, Tradewinds had two years to use a shared space in a prime downtown location, build operations, understand the financial ups and downs of the restaurant and catering business, and gain a following. These business development, startup coaching, and incubation programs are meant to provide entrepreneurs with resources, skills, and facilities to get new businesses off the ground and on the path to long-term economic stability. The first couple months of operation were tough. It was winter and foot traffic was low. Other folks in the incubator space sometimes left the doors open for deliveries, driving down the temperature inside the building. Customers said they’d be back in spring, when they wouldn’t be able to see their breath while they ate. Some days, Tradewinds didn’t make a single sale. Yet with food service experience in restaurant kitchens as well as operating a food cart for events since 2010, Head and Shadrick persevered. They used the time that winter to experiment and refine their menu. Catering gigs and a wholesale operation making and distributing hummus to local grocers kept the bills paid. By March, spring was warming things up. Tradewinds began attracting steady customers who liked the Mediterranean-inspired menu. Lunch and dinner crowds were coming in to enjoy creamy gorgonzola and walnut wontons, gyro or falafel pitas, flatbread pizzas, or the signature “Medi Bowl,” a combination of rice pilaf, tahini sauce, Greek salad, and a choice of gyro, chicken souvlaki, or falafel. Sprout! was designed to give businesses a limited time to build up and then move on. In October 2016, Tradewinds had completed their time in the program—but they had a slight problem. Yet without a space, Tradewinds came to a standstill. The end of 2016 gave Head and Shadrick time to reflect on where they wanted Tradewinds to go next. They knew, however, they wanted to maintain their vision of starting small—just the two of them—and evolve and scale as they learned what worked and what didn’t. They also had encouragement: customers were disappointed about Tradewinds leaving Sprout!, but they expressed their love of the food and wanted to be in the loop once Tradewinds had a new space. 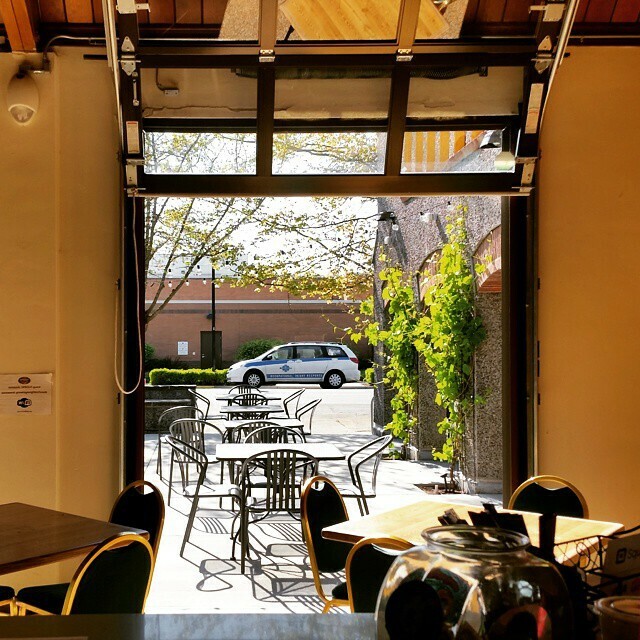 In the beginning of 2017, Tradewinds saw an ad saying that Alpine Catering in nearby downtown Eugene was looking for someone to use their space outside of their daytime hours. Tradewinds would only be able to use the kitchen and dining space during the evening—so no lunch hours—but it would get them back in the game. As Tradewinds rebuilds, Head and Shadrick aren’t just focusing on the day-to-day operations—they’re looking ahead and considering permanent locations. They want to move into a dedicated restaurant where they can offer lunch, dinner, and drinks, along with to-go options and off-site catering. They want to have the space to accommodate the larger staff required to help in the kitchen and to staff catering events. During hours when the kitchen is closed, they also plan to make it available to startup operations, to pay forward the help they’ve received. They are also focusing their cooking on where they want the restaurant to be in the future. Inspired by the cuisines of cultures along Asia’s original Silk Road, they have a wealth of culinary traditions to work with—along with the innovative and creative approach that are the heart of Tradewinds. Hone in on your passion. Do you have to do this regardless of anything else? If you’re solely driven by making money, this probably isn’t the right place to be. Do you really want to do it? Decide if you have the time and dedication. When you get into this business, you might have to be working 60, 70 hours a week—and that might be a good week. Head says while at Sprout!, he and Shadrick were each working about 70–80 hours a week on average. Learn to delegate. Otherwise, you stay too caught up in immediate operations and stop having time to focus on bigger-picture business growth. That, warns Head, is the path to burnout. Learn all parts of your business. No job is more important than the next. “Everyone does everything. Front of house, back of house. You wash dishes, you sweep floors, you bus tubs. No one is more important, and that includes the owners and operators,” says Head. “We are doing exactly what they’re doing too. Nothing is beneath anyone. Somebody has a good idea? Bring it up. If it’s a good idea, it’s a good idea.” When staff sees owners in the thick of regular operations, it builds morale and encourages motivation, quality, and loyalty.